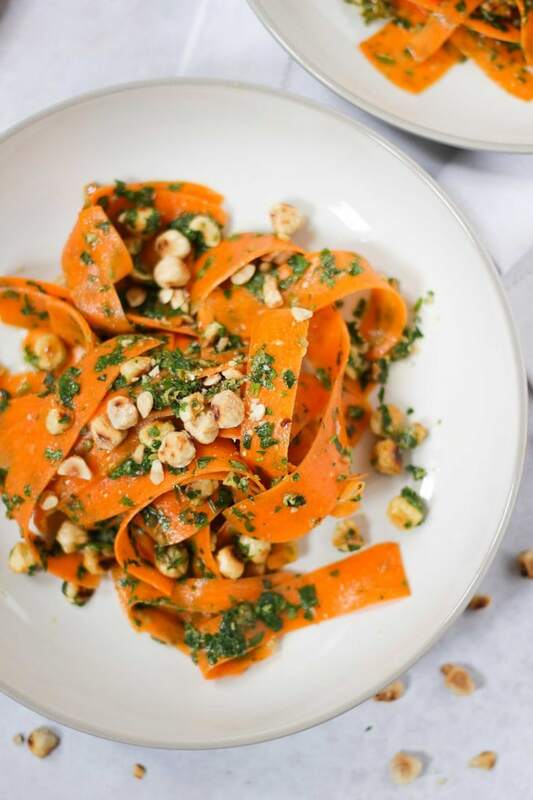 An easy and delicious Carrot Salad recipe with herb dressing. This healthy, raw carrot salad is the perfect summer or winter salad and a great lunchbox idea. This recipe is sponsored by Marks and Spencer’s, as always thank you for supporting the blog. Hi Christmas overindulgence and eating all of the yummy stuff season! There’s always a point during this season of excess when it occurs to me that I could do with eating some salad. But who fancies lettuce at this time of year? Marks and Spencer’s got in touch with me recently and asked me if I’d like to test out some of their cookware, to make a simple carrot salad. They came up with this dish as a quick and easy side, or base for a main meal. They wanted to show that even in a short amount of time, with the right kit, we can all serve up healthy and fresh food. This Carrot Salad is the perfect antidote to all of the cheesecakes I have been making and testing recently so I jumped at the chance. I mean surely my Terry’s Chocolate Orange Cheesecake classes as one of your five a day, but if in doubt serve after this Carrot Salad and all bases are covered?! How do you make a carrot salad? 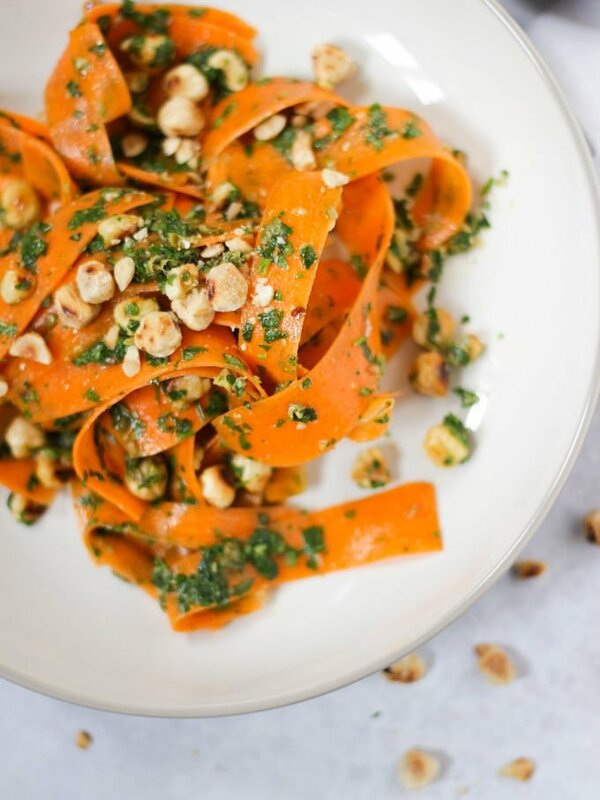 This Carrot Salad recipe is super simple when you have the right tools. 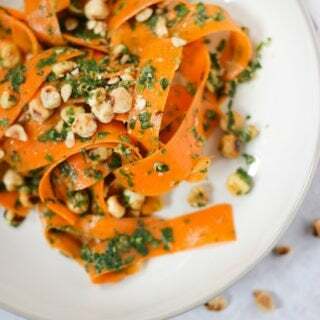 This salad uses carrot ribbons and a simple green salsa verde, made with mint, basil, flat leaf parsley, garlic, capers, anchovies, garlic and lemon juice. I added toasted hazelnuts for bite and sprinkled some on top to serve. How do you toast hazelnuts? I toasted the hazelnuts in this Anodised frying pan (£22.50). It takes around five minutes to toast them over a low heat, keep stirring them or shaking the pan to stop them from sticking. 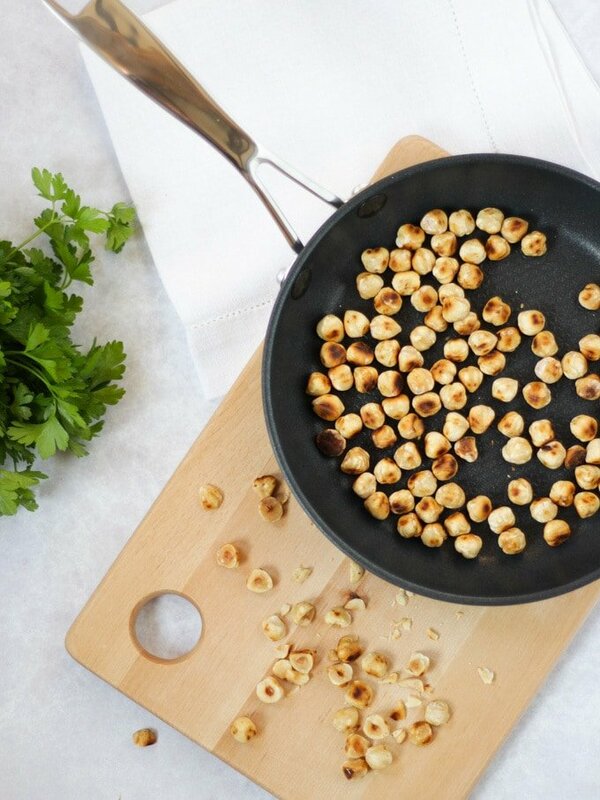 A heavy frying pan is a must have for items that are easy to burn like these nuts, the wider surface area spreads the heat more evenly around the pan stopping hot spots. I loved this pan, it’s light but still sturdy. Its also so good for scrambled eggs and its non stick surface means that you need to use very little oil, so it’s even a healthier option. 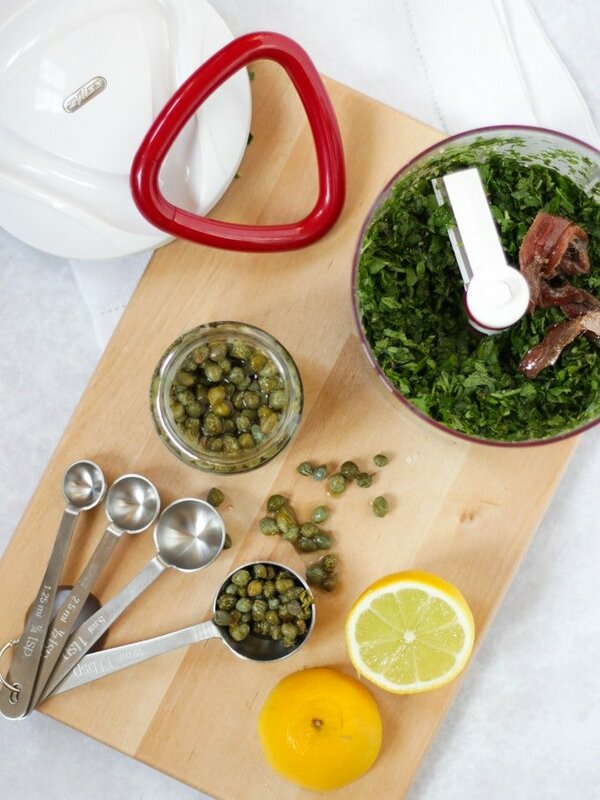 How do you make a salsa verde? 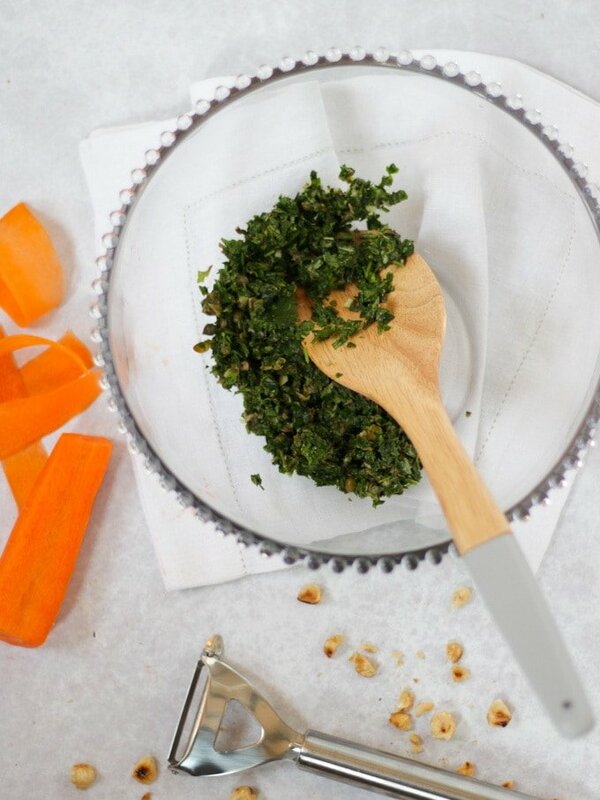 Whizzing up the herbs to make a Salsa Verde for this Carrot Salad was an absolute pleasure in this M&S Chopper. Long time readers will know I love a kitchen gadget, especially time saving ones like this. 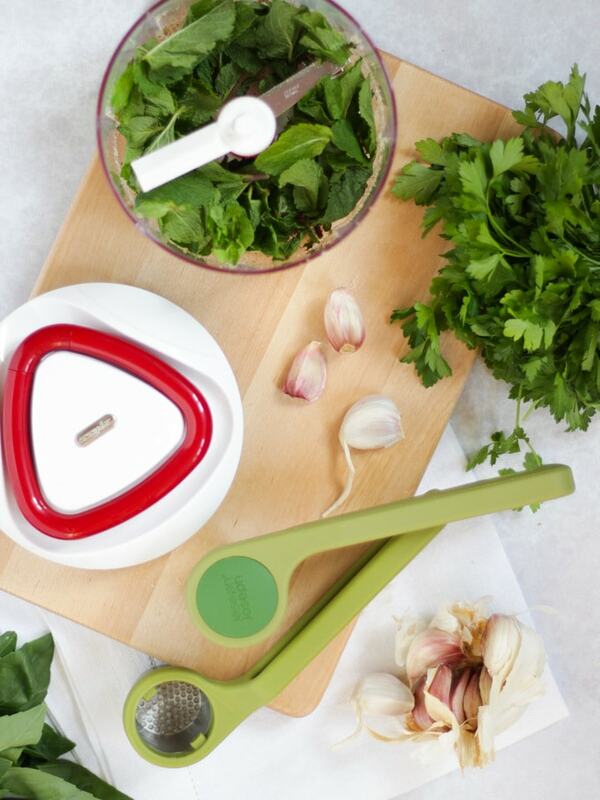 The simple cord operation means you don’t have to plug it in, simply pulling the cord turns the blades to chop your herbs (salad, fruit or vegetables). It is also compact and easy to clean, this hard working but of kitchen genius has definitely earned its place in my new Taming Twins kitchen. I added parsley, basil and flat leaved parsley, and anchovies along with garlic crushed using this nifty Garlic Press to my chopper. 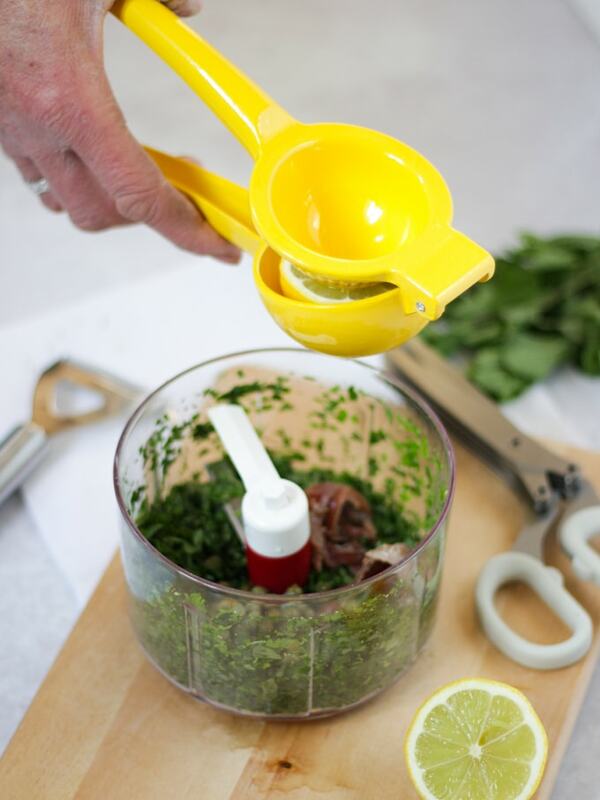 I squeezed the lemon juice directly in from this Lemon Squeezer, not a pip in sight! How do you chop carrots for a salad? I chose to use carrot ribbons for this salad, no fancy machinery was used to make them I simply peeled them using this Y shaped peeler. You peel along the entire length of the carrot, rotating the carrot as necessary until it is too thin to peel, and voila carrot ribbons. I combined the carrots with the other ingredients and served with the remaining hazelnuts sprinkled on top. Can I make a Carrot Salad in advance? This Carrot Salad is the perfect make ahead recipe. I would make the salsa verde upto 24 hours before serving, that little bit of extra time allows the flavours to develop. You should store it in an airtight container in the fridge or covered in this Glass mixing bowl, which is also pretty enough to serve in! I would grate the carrots and toast the hazelnuts just before serving for maximum bite. What can I serve a carrot salad with? This Carrot Salad makes a healthy accompaniment to lots of dishes, it would go really well with some of my leftover Slow Cooker Ham on Boxing Day. Or you could serve it alongside my Easy Flatbread and Smoked Mackerel Pate for a healthy lunch. You could also add some rice to make it a more substantial main meal. To make it quick and easy I keep some microwavable rice pouches in the cupboard which would be perfect with this! You could add grilled chicken or halloumi to this Carrot Salad make this a more substantial main meal. This Carrot Salad makes a great packed lunch idea, store in a sealed container in the fridge until lunch time. You could put raisins to this recipe for a classic Carrot Salad addition. These Servers are perfect for serving the Carrot Salad and make a beautiful addition to your table. Hope you enjoy this recipe as much as we do. 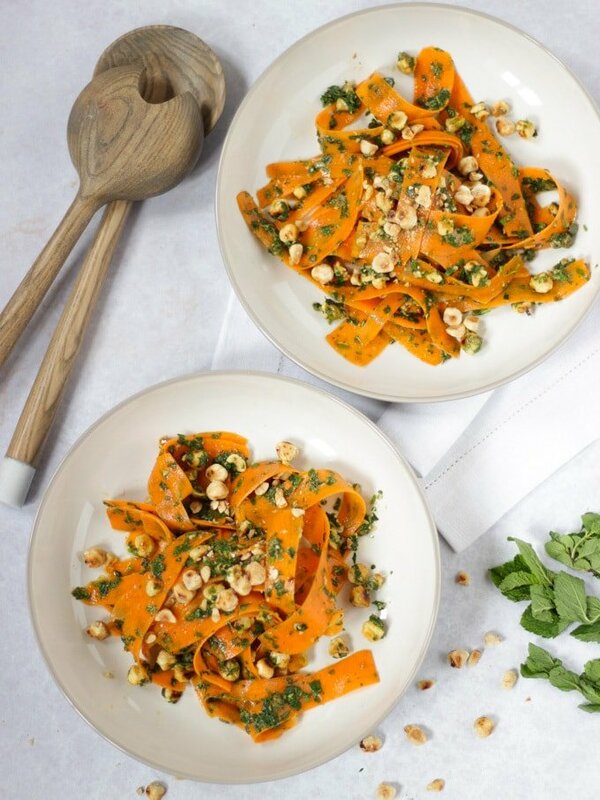 I’d love to know how you got on and what you thought of it if you make this Carrot Salad recipe. Please rate the recipe and leave me a comment below if you do.